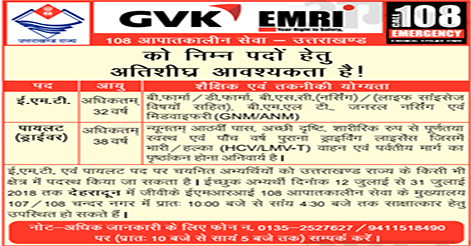 GVK EMRI (Emergency Management & Research Institute) has released advertisement for the recruitment of E.M.T & Pilot (Driver) for ambulances operated in Uttarakhand. Department invites candidates for Walk in Interview for E.M.T & Driver post from 12 July to 31 July 2018. Good vision, physically fit and healthy, and a 5 year old Heavy / Light Vehicle driving license & approval of driving in mountain passages is mandatory. 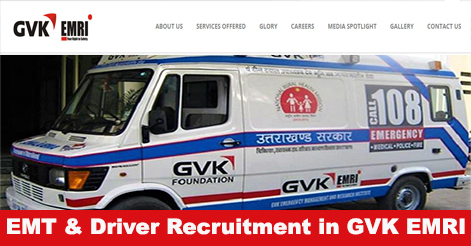 Help us to improve this article/job posting "Walk-in for EMT & Driver post at GVK EMRI Dehradun". We would be glad if you can comment below and provide your valuable suggestions and feedback. If this page have any wrong information/list or out of context content, then you can report us as well. What is timing for d.pharma. 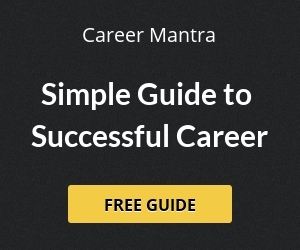 I am bsc MLT…. with 2 years experienced.. I am 10th…2 years experience heavy license. Sir pilot ke leay mountain driving approval hona jaruri h.ya kebal mountain driving knowledge hona chahiye. I am interested this job.Earjently required me. I m interested the job and my hill experience is 10year.